At Naples Marine Construction, we understand and respect the challenges of working in the marine environment. Our team of seasoned marine construction experts are able to anticipate, comprehend, and resolve even the most complex issues associated with your project. Whether it involves the preservation of mangroves or bringing in a licensed structural engineer to provide the county with the necessary report to obtain your permit, our team is extremely thorough and experienced in all aspects of marine construction. Just as importantly, we also understand that your waterfront is an extension of your home, and we treat you and your property with the utmost respect, keeping our trucks, boats, barges, and work-spaces neat and clean throughout the entire scope of the project. 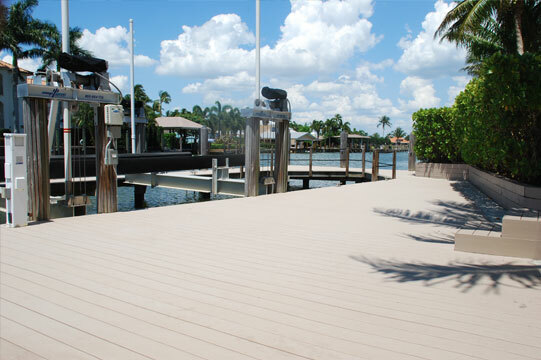 As you navigate through our site, you’ll see that highly skilled craftsmen, using only the very finest materials, construct our luxury decks, docks, boat lifts, and seawalls. Our work ethic is reflected in our logo – the nautilus shell. The nautilus is a symbol of perfection and beauty, two goals we strive for every day, on every project. Able to withstand immense pressure, the nautilus is also a symbol of strength, balance, and precision. We work closely with you to design tasteful architectural structures that flow with and add to the beauty and value of your home. Additionally, we take the time to understand exactly how you envision using your space to ensure that the end result is a smart and functional design your family will enjoy using for years to come. We employ professional craftsmen who are highly experienced and skilled in their trade. Our craftsmen pay strict attention to the smallest of details resulting in quality you can count on. We fully recognize that we are working in your home environment. Our craftsmen are not only skilled, they are also professionals who conduct themselves with respect for your property and privacy. Work areas are properly maintained and thoroughly cleaned at the end of each day. Q: What kind of permits or licenses are required for marine construction? A: There are a variety of different licenses and permits required before beginning a Marine Construction project in Naples and Collier County. As a fully licensed and insured marine contractor, we will take responsibility for obtaining any and all required residential or commercial permits. Q: How much do marine construction projects cost? A: Of course, the cost of your project depends on its scale. Before we begin any work, we will sit together for a free consultation, and set forth concrete expectations and mock-ups for your project. We will work together during the entirety of the project to make certain you understand what we are doing in terms of work flow and costs. This attention to detail allows us to offer some of the most competitive pricing in the area. Q: How long do marine construction jobs take? A: Again, depending on the scale, we can work together before any construction takes places to make sure we are on the same page when it comes to the delivery date of your project. If you need something done as quickly as possible, we will work to try to accommodate you. At Naples Marine Construction, we strive to set a new standard in customer service. We understand that a new or remodeled dock is an extension of your home and a big part of your Paradise Coast lifestyle. We also recognize that a new waterfront construction project is a meaningful addition to and a significant investment in your home.